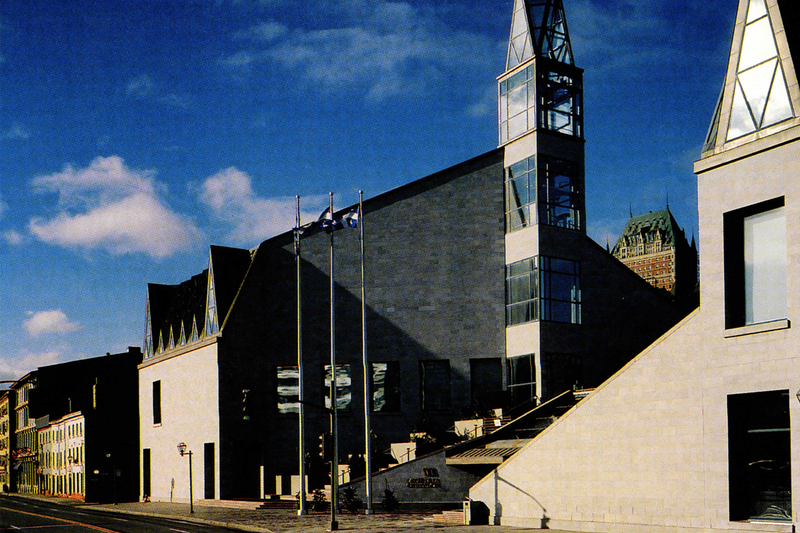 On the 9Th of December 1980, the decree 80-215 officialised the government decision to build a national Museum of Civilisation in Quebec. - The creation of the Museum of Civilization will compensate for the lack of a museum dedicated to show the many particularities of our civilization, its origins, its evolution and the various influences that have transformed it. - The new institution will be gifted with sufficient space to display an important collection of ethnologic items that the limited space of the Museum of Québec never permitted to show until now. - The celebration of major international cultural events will be supported and facilitated by the equipment designed according to international norms and standards. - The future Museum will possess all the facilities to respond to various animation programs, conferences and pedagogic workshop, which are essential to fully comprehend the exposition. All of these museum animation services will facilitate access to cultural activities, that are actually available in the majority of modern countries, for the whole population. Not only the will the project will be a key instrument to achieve museum mission, it will also contribute to revitalize the lower city sector, near the Place Royale, where the Museum will be built. According to the government procedure, that provides the holding of a design competition for big scope projects, the Ministry of public Works and Supply intend to benefit from the experience gained during the realization of the two last design competitions. However, we can affirm that the procedure remained quite unchanged since the Courthouse of Quebec design competition, held during the summer of 1979. Nonetheless, the specific realization requirements of this project of the national Museum of Civilization reflect themselves in the competition design significance. Indeed, the Ministry plan to execute this project in two distinctive phases. The competition covers the conceptualization of the whole project, but intend to prepare the plans and estimates for the first phase only. Thus, none of the directives regarding the second phase of the project should be interpreted as a commitment from the Ministry to the competitors. The construction of the national Museum of Civilization, associated with recycling and rehabilitation projects actually ongoing on the Place Royale and the Petit Champlain Street, and eventually at the University of Quebec in the Old Port, will certainly contribute to enhance this harbour neighbourhood of the Lower City that was overlook by socio-economic changes of the past decades. Also, it is interesting to note that the new museum will be erected at the exact same place that the civilization it celebrates was originally rooted. However, the conception of the project present challenges beyond its technical consideration. Clearly, the imagination and the creative skills of the competitors will be put to test. Indeed, the insertion of a new building in an historic and venerated urban grid demand a high sense of sensibility and refinement. In a historic area, new architecture must assert itself while respecting the rich cultural vestige of the past. The balance of scale, rythme and architectural vocabulary must connect and complement the old with the new. The creator should inspire himself with the observation and the meticulous analysis of the specific landscape of the future project; the limits of this landscape expand far away from the building site boundaries. If the functionality of the project justifies it, the creator could then interpret and integrate these particularities to the project; size, volumetry, proportions, materials, textures and colors are composition elements that can confirm an effort of integration and continuity, if used repeatedly. It is wrong to believe that the contemporary intervention should appear timid and camouflaged. In the contrary, it should be proud, fierce and original, but also subtle, sober and aware of the historic nature of the area. The harmony of the forms, the nobility of the materials and the refinement in the details prevail on the ambitious and extravagant architectural manifestations. In historic area, the preservation and the enhancement of the old structures are primordial. Instead of what is often seen elsewhere, the addition of new building must contribute to enhance and improve the old urban grid, not denature it. The five (5) projects submitted to the jury present an outstanding quality regarding the clarity of the graphic expression and the care taken in the presentation. The diversity of answers brilliantly shows the relevance of a competition designs seeking for original solutions regarding a major architecture project for Québec society. On many levels, the competitors presented a high sensitivity to the physical and human environments in which the Museum is inserted. The projects scales, the choice of materials, the care taken in planning accesses and visitors' welcoming, the distribution of public spaces demonstrate the concerns and involvement of the competitors. The submitted projects generally respected the competition brief, although it was noted that both the circulations and accesses strategies and the functional logics showed a great diversity. - Some projects favour pedestrian's access on St-Pierre Street, thus creating a welcoming zone. Others emphasise group's access on Dalhousie Street. All competitors conserved, with unequal results, visuals outlooks to the river. Plus, the Estèbe House is ever enhanced by a great composition axis or by the creation of a public place. - The primary functional organization significantly varies from a project to another. In four projects, the exhibition galleries are arranged on three floors; and a fifth project disposed the same galleries mainly on 2 floors while creating a small permanent gallery on an intermediate third floor. As we wish for both permanent and temporary galleries on the ground floor; four projects had one or another type of gallery, and only one project presented both. Other functions, as pedagogic workshops, are located directly in the basement, the ground floor or the first floor. For all competitors, the St-Jacques Street imposed itself regarding the artworks access. - All competitors underestimated the flooring areas, and after verification, the overtaking extend to 6,9% to 14% compared to the competition brief. Possibly, the underestimations could be explained by a disagreement regarding the calculation process used by the competitors and the method used by the auditors. - However, it was noted that none of the projects present significant breaches to the operational bidding of the program and the basic requirements of the competition rules. The Museum is inserted in a privileged environment that is gifted by both the presence of the river, the cliff, the building overhanging on it, and the historic Old-Québec. Its completion will constitute a major intervention in the urban landscape of Québec city and it will surely inspire more considerable neighbourhood development. The site in itself, the enhancement of the Estèbe House and the integration of the Marine Institute act as constraints that conditioned the competitors' conceptual processes. Their interpretations of the program and urban integration challenges have resulted in two very different solutions. Four projects proposed a monumental approach that is integrated with the environment by contrast. This integration is realized with unequal success regarding the scale and details of secondary elements as glazed openings, ground connections, exterior spaces organisation, void and solid rythms or rooftops disconnections. One of those projects achieved a brilliant work of volumetric articulation and reduction. Another team proposed a building with a sharp and strong shape that voluntarily contrasted the urban context but that also reminded the Old-Quebec architecture, regarding its materials, its vocabulary and its details. A fifth project proposed an architectural statement clearly different from the other designs. The scale, the treatment of the volumes and the rooftop create a sensible, finely modulated and intimate architecture that respect the historic site and evoke the urban context's grid. The architectural aesthetics chosen by the competitors attest the diversity of approaches, from an international vocabulary or a timid post-modernism in some case, to a savant and subtle contextual vocabulary. A project's architectural quality holds on its integration to the environment, its scale, the articulation and legibility of interior spaces, the volumes and surfaces treatment, the choice of materials and the animation of interior and exterior spaces by the integration of artworks. Those aspects, and many more, may enhance comfort, tranquility, and user's interests; plus it may create a feeling of community and belonging. In addition of those architectural aspects, the Museum program propose other features that awakens deep resonances for the Quebecker visitors. Namely, the Old Dock's remains and the Estèbe House will be celebrated in a way that evokes the origins of our implantation in America. The submitted projects attest a great sensitivity regarding the architectural performance, but the proposed solutions are not equally efficient. We already briefly discussed integration to the environment integration, building volumetric strategies and architectural aesthetics. Also, the diversity of solutions and approaches has been noted. All the projects' principal functions articulate through a central space, visible from all floors. The Estèbe House is highlighted by the principal axial orientation or by the creation of a space joining two important axes. The Old Dock is unrestricted and water features emphasize its presence, although in one project the Old Dock installations are not asserted. The space animation by the integration of artworks is perceived like a weakness for those projects, reflecting the ambiguous status of the building itself as an artwork and an animation device. Thus, the winning competitor refuses to commit: the water features celebrating the Old Dock and cascading through the public spaces in the basement is granted the whole budget allowed to artworks and animation. However, the winning competitor only evoked a potential "horizontal fountain" symbolizing the seasonal fluctuations of the river. Two projects proposed various installations in harmony with the Museum's thematic. Two other projects intended to use static mediums integrated to the architecture. The overall review is not positive, but the project's nature predictably leads to this outcome. Finally, the aspect of exterior spaces design deserves to be noted. Three projects created a Museum's place at the St-Pierre and St-Antoine streets corner. The two other projects occupied almost all the ground space allowed, but managed to create an inner courtyard facing the Estèbe House. All projects used water features that suggest a relation with the river circulation's scheme. One project extended the river through the second phase's great stairs evoking an 18th century's design. This feature is also an extension for the pedestrian way above the central hall of the Museum. This architectural statement creates a feeling of surprise that leads to the simultaneous discovery of the Old-Québec, the cliff and the river. The Museum projects itself in the environment. The area selected for the Museum featured infrastructure problems due to the water table level variations through the tides. The jury noted the potential vulnerability of any sealing foundation systems in case of earthquake, and considered appropriate to foresee a seepage water pumping system. Regarding the construction, all projects are achievable because they rely on approved and well-known methods for professionals and construction businesses. One project proposed a stair, terrace and lightly inclined glass plate network above the central hall that needed a special care regarding the rooftops' sealing. Mechanical and electrical systems were generally well considered. All competitors proposed solutions that saves and re-uses energy while streamlining those systems' utilisation by working with all well-known and available techniques. On the whole, the low energy consumptions were achieved by choosing triple glazing, controlling the fenestration and using solar passive energy. Original solutions were proposed to take advantage of the river, and it is noted that the projects demonstrate a great comprehension of thermodynamic laws. However, in some projects, the jury deplored the lack of integration between mechanical or electrical systems and other building's systems. It appears that the architectural solution has been developed separately from the technical systems, which forced the engineers to adapt to architecture afterward. All competitors must comply with the competition brief regarding the scheduled work completion. However, for the majority of teams, the allowed time provided is insufficient. One competitor proposes to initiate drafting the plans and the execution estimates as soon as he sign his professional services agreement, which seemed unrealistic to the jury. The weakness of the works schedule could be discussed and easily improved within the allowed project completion schedule. Two competitors presented slightly inferior construction cost estimates that the budget stated in the competition rules. The three other competitors foresee moderately higher construction costs than the planned budget. The verification performed by the consulting firm, chosen by the Ministry, revealed that all the competitors underestimated their projects' costs. Taking account of the adjustments proposed by the consulting firm, the budget overspending possibly extend from 6,2% to 13% of the construction budget. Jury members strongly appreciated the honour to participate in the holding of the design competition. They lived an enriching experience regarding the quality of the projects submitted to their attention and the significance of the competition in itself. The competitors showed innovation and sensibility in respond to the challenges of the project program and they highly deserve the jury appraisal.